We have such a fun kit for you this month. The Filled with Joy card kit will be available Tuesday, September 25 at 10:00 am EST. 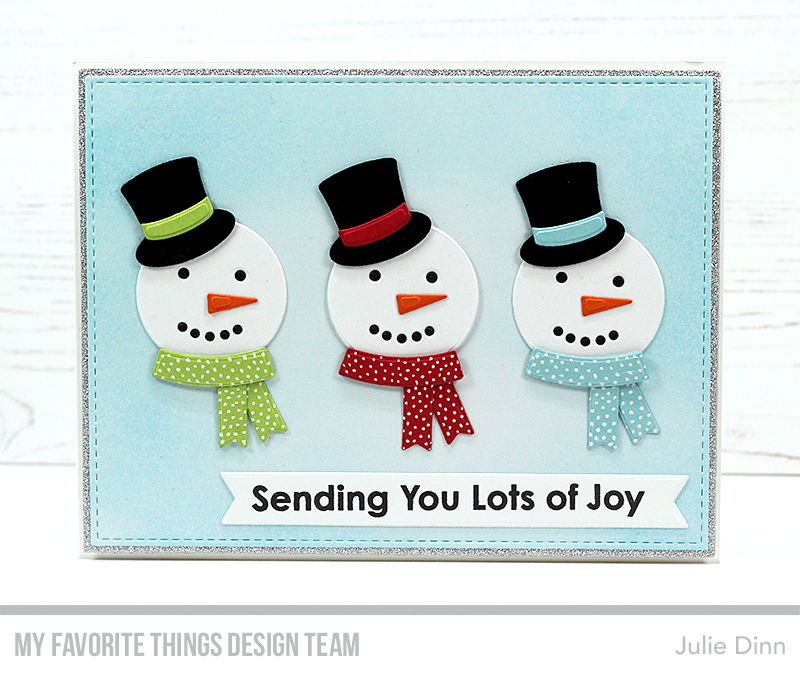 My card today features the adorable snowman dies in the kit. I used Sour Apple, Red Hot, and Berrylicious for the scarves and accent on the hats. I added polka dots to the scarves with a white gel pen. The hats were cut from the amazing Black Velvet sheet included in the kit. I love the look and feel of this paper. The Filled with Joy stamp set in the kit is filled with all sorts of fabulous sentiments. I stamped one of them on an Essential Fishtail Sentiment Strip. Sweet card. Love the colorful snowmen. The snowmen are too cute, love their little polka dotted scarves! Your snowmen look like they are all dressed up and ready for a party. Such a sweet card. Thank you so much for sharing..Happy Crafting. Love your snowmen trio! Fun and colorful--The polka dots on their scarves are a nice touch. Lovin' this release! So cute - love the tri-colors! How cute! This kit looks like it will be a lot of fun. Great card, I love snowmen!! Adorable card! Love the polka dots on their scarves! Love this trio of snowmen. So cute. Love this card! Very nice use of the snowmen! Adorable snowman trio, love the vibrant colors against the white background. I can't wait to check out the black velvet card stock, it looks awesome. Three heads are always better than one. Seriously, this is a grand-looking card for the upcoming holiday. Hi Julie. LOVE your cards - love this card kit too. TFS. I never get good ideas so I most certainly rely on you girls and you always come up trumps. Many thanks. So sweet!! This is so sweet! I love your trio of snowmen and their dotty scarves!